Fulham vs Manchester City predictions and betting tips for Saturday lunchtime’s first Premier League fixture since the international break. Champions City head to Craven Cottage knowing that a win will see them leapfrog Liverpool in the table before their match with Spurs on Sunday. There are no two ways about it – the future certainly looks bleak for Fulham. The west Londoners have lost 10 of their last eleven fixtures and you have to feel that Scott Parker has a somewhat thankless task if his brief is to try and steer The Lilywhites away from danger. In reality, you’d expect Fulham to be preparing for life in the Championship having amassed just seventeen points from 31 matches so far. City, meanwhile, still eye a possible quadruple and are fighting on all fronts as we approach April. Unsurprisingly, Pep Guardiola’s men are massive favourites to win this one but you’d expect them to do so in style – particularly when so many of their players are in exceptional form. I can see the visitors dishing out one of their customary thumpings, and they’re 6/5 to win this one by three goals or more which is the first Fulham vs Manchester City prediction for this weekend. There are very few players in the world right now who can claim to be performing at a level superior to that of Raheem Sterling. The 24-year-old has defied his critics throughout the campaign and scored a hat-trick for England during their 5-0 drubbing of the Czech Republic last Friday. Domestically, only teammate Sergio Aguero and fellow winger Eden Hazard can match Sterling’s goal and assist totals, which is a testament to the way he has played all year. It’s easy to forget that the ex-Liverpool man averaged a goal every other game last season which made it his highest scoring campaign to date – and there’s still plenty of games left for those figures to be eclipsed. He’s even money to bag anytime against Fulham on Saturday lunchtime and with the form he’s in, you’d have to be a brave man to write him off. It won’t come as a shock to read that I think an away win is all but nailed on here – and it could be a really miserable afternoon for Fulham. Sure, they put up a decent fight against Liverpool before eventually succumbing but there’s just something about the scintillating manner in which City are putting teams to the sword right now. On paper, it would be almost impossible to suggest that this isn’t City’s easiest away fixture of their run-in, so let’s see if they capitalise on the opportunity. You can get 11/1 on them winning this one 4-0, which is actually considerably longer than the odds some of the stingier firms elsewhere are offering! Read More: See more Premier League tips or check our our football accumulator for today including five selections. Raheem Sterling has been in sensational form for both club and country in recent weeks and he should start for Pep Guardiola’s team here. City can go back above Liverpool at the top of the Premier League table before Liverpool kick a ball this weekend and that will be a huge incentive to Manchester City. Fulham’s troubles are much worse and they’re heading back down to the Championship despite having a decent looking squad on paper. Mitrovic chips in with a few goals and Ryan Babel has looked a decent acquisition since arriving in January. He scored in Fulham’s last match, a 2-1 defeat to Liverpool. Man City have a deep squad but they still have a lot of injury concerns including Kevin De Bruyne, Vincent Kompany, Fernandinho, Fabien Delph. John Stones and Benjamin Mendy. Fulham will be without Alfie Mawson. Use a free bet to win £42 cash if Man City win. 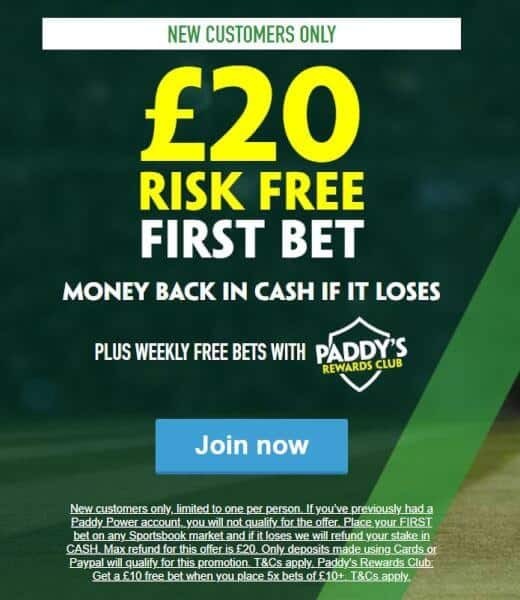 Open a Paddy Power account and bet £20 on Man City to beat Fulham (-2 handicap). 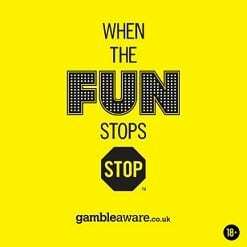 If they do, you win £42, if they don’t, you get a £20 CASH free bet.